Fern, a dog rescued by Young At Heart Pet Rescue. 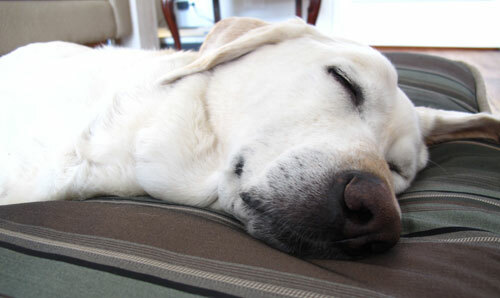 And yes, the lead image is a dog because we like to pander to people's love of animals. The Man Up Chicago Holiday Gift Guide is winding down, but if you’re shopping for gifts this weekend, we have a three suggestions. 1. If you’re looking for locally made jewelry by a nationally recognized designer, check out the Toki Holiday sample sale going on from 11am – 5pm this Saturday and Sunday in Bucktown at 1422 W. Willow St., Ste. 200. 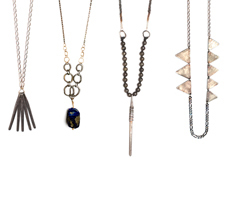 We interviewed Toki owner Tonia Kim a few months back about selecting jewelry for a significant other. Read the Q&A and then head over to the sale, where items will be marked down by up to 70 percent. Also 15 percent of proceeds will benefit Young At Heart Pet Rescue a non-profit that rescues, rehabilitates, and rehomes homeless senior pets, like Jesse from Family Guy, or Fern, pictured above. Cue the Sarah McLachlin music. For more info on the Toki sample sale, email Tonia Kim at tonia@tokicollection.com. 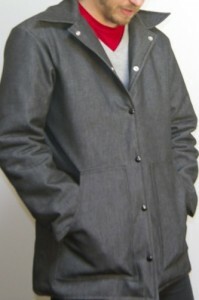 City Mouse Country Mouse Work Coat. 2. The rapidly expanding Chicago Blogger Network released a gift guide for Chicagoans compiled by Chicago bloggers (including us). There are 34 gift ideas, and the guide includes presents that work well for guys, girls, and even kids. 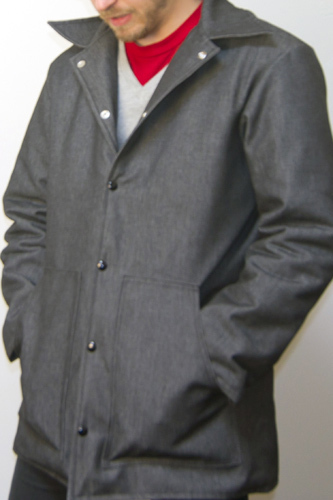 Our favorite gift — recommended by The Indoor Beach — is this gray work coat ($220) made by the Amish (but sold on the Internet). Wear it with dress clothes, casual clothes or just a chin-strap beard. 3. Finally, we wrote about our favorite Chicago-themed holiday cards last week, but we were recently informed of another great Chicago-themed card that is worth checking out. 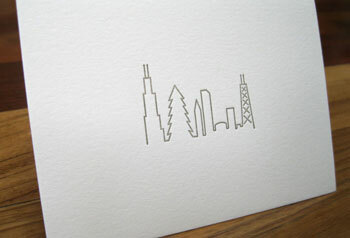 The card (pictured below) is by Chicago design company st&, and features a simple letterpressed drawing of the Chicago skyline with a Christmas tree inserted into it. It’s minimal and clever. So don’t ruin their charm by filling them holiday glitter. $3.50 per card. A Chicago-themed holiday card from sg&.